And this, sadly, summarizes what is going on with Democrats and education. It's about politics, power and interests — not about excellence. And here we must note the perverse influence of teachers unions. Two prominent Democrat Senators, Cory Booker from New Jersey and Elizabeth Warren from Massachusetts, are both on record in previous years, before being elected to the Senate, supporting parental choice in education. 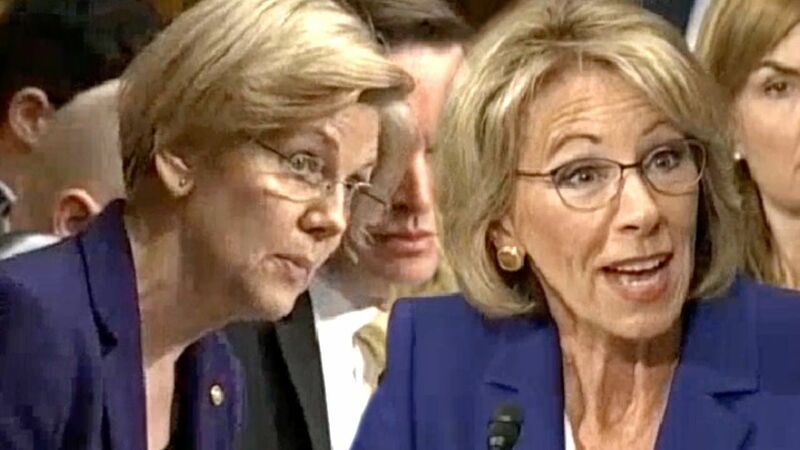 Yet both, after getting elected to the Senate, and both with presidential ambitions, have somehow changed their minds on this critical issue and both voted against DeVos's confirmation. Booker, while mayor of Newark, New Jersey, in 2012, gave the keynote address for Betsy DeVos's organization American Federation for Children, and spoke passionately for parental choice. The protest was encouraged on Twitter by president of the Washington Teachers' Union Elizabeth Davis, who said, "We want to share the message that we love our public school system." In a Gallup poll published last August, 28 percent of parents with their oldest child in a public school said they were "completely satisfied" with the education their child is getting. This compared with 62 percent whose child is in private school saying they are "completely satisfied." The 62 percent satisfaction with private school was the same for high-income parents and for medium- and low-income parents. Yet teachers unions and the many with allegiances to the Democratic Party fight to keep the government monopoly of public schools. Fighting for their own selfish interests, they hurt America's children and our nation's future.